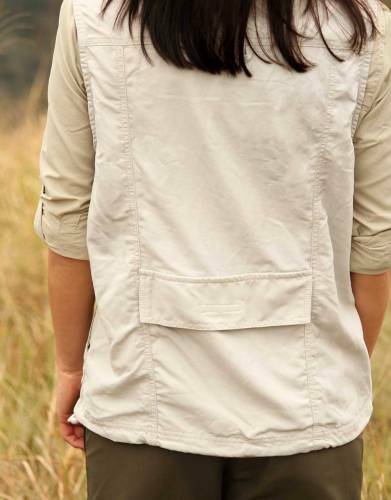 Made from lightweight, strong technical fabric with nine pockets for your gear, the unisex Rufiji™ MaraTech™ Multi-Pocket Gilet is the stylish multi-tool of safari and adventure clothing. 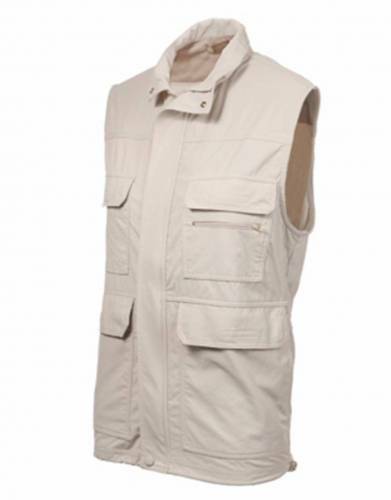 In addition to looking the part on safari and outdoors, the unisex Rufiji™ MaraTech™ Multi-Pocket Safari Gilet has been designed to be functional. 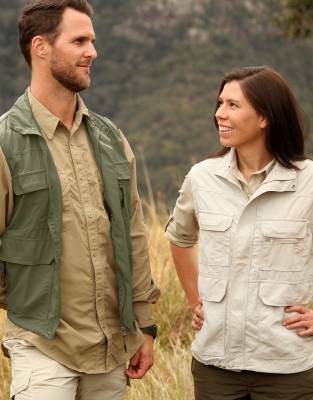 For adventure travellers, this is the outdoorsman and woman’s dream gilet. 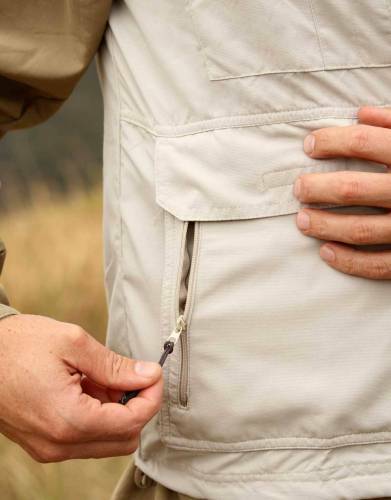 MaraTech™ Ripstop fabric sets itself apart as being cool, lightweight, yet very strong. Its moisture wicking capabilities draw moisture away from the skin to keep you dry and comfortable in warmer climates and the built-in SPF50+ offers maximum sun protection. The SilverPlus anti-bacterial technology keeps your shirt smelling fresh between washes. It is also quick-drying and easily releases wrinkles, making it perfect for travel and the outdoors. The full-length zip can be zipped right up or worn open and the elasticated waistband can be adjusted to suit the conditions. 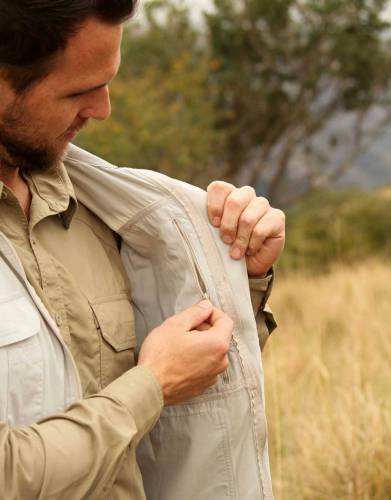 Whether you are on safari or whatever your outdoor or day-to-day hobbies, the extra pockets on this gilet will always come in handy. With nine pockets in total, you are sure to have more than enough space for film, guidebooks, sunscreen, documents, pens and small notebooks, and other accessories. 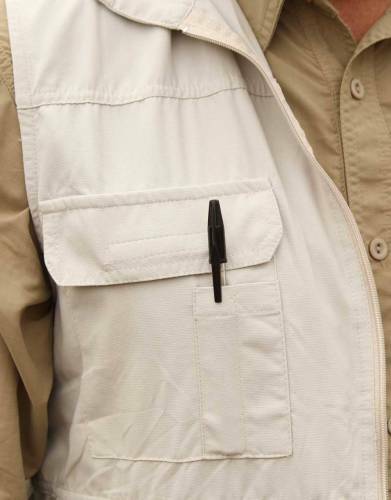 These pockets include two pockets with Velcro closure, one of which has a small zipped security pocket and the other with two slots for keeping pens or a torch. There is also one large zipped security pocket on the inside of the gilet and one large pocket on the back of the gilet. 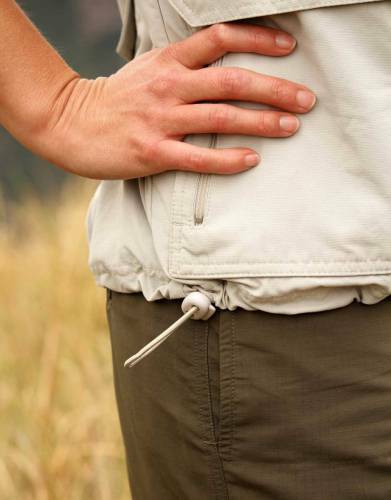 The two waist pockets also have Velcro access and one has an extra small security pocket. 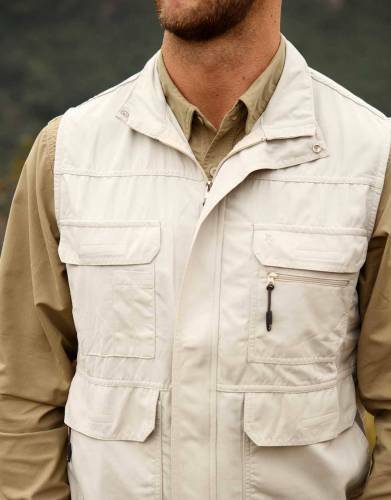 This gilet has all the functionality you need for rich, full days on safari and outdoors and is convenient enough to use daily. 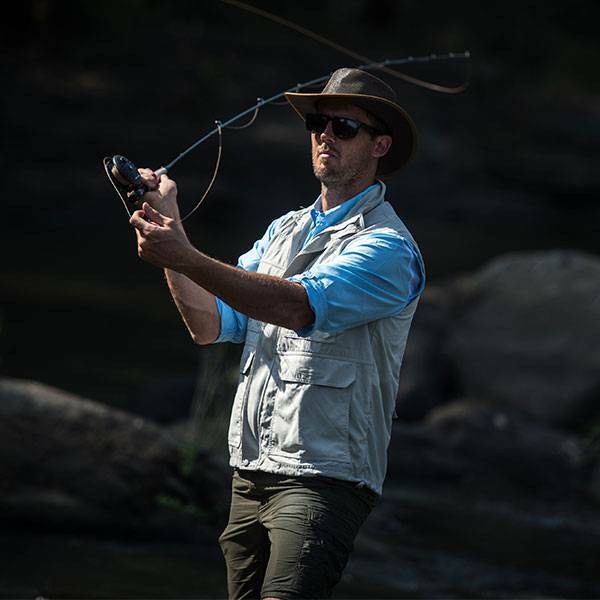 About Rufiji™ Outdoor Apparel: We have spent years going on safari and we know African and adventure travel conditions intimately. We know what works best in extreme climes and what we demand from the clothing we wear. Simply put, other products on the market did not perform to our standards. 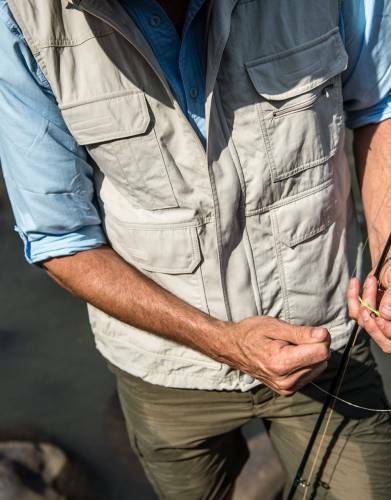 The next step was obvious: to design and manufacture our own safari and adventure clothing range. 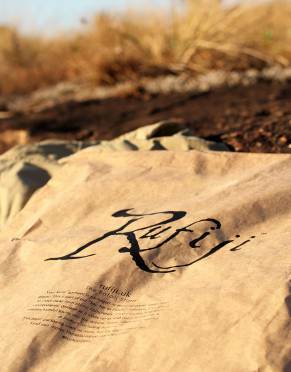 The Rufiji™ range was born. 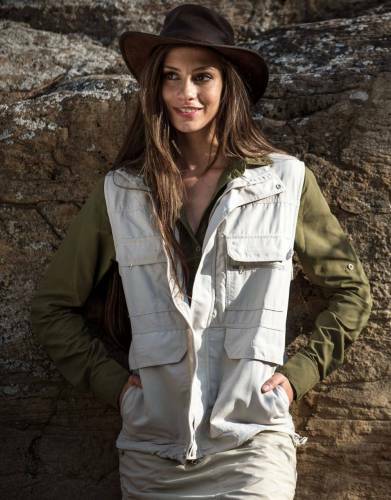 The result is a line of clothing that has been tailored for your travels, with the unisex Rufiji™ MaraTech™ Multi-Pocket Safari Gilet a key part of the range. ⊙ MATERIAL: 100% strong, lightweight Rufiji™ Ripstop MaraTech™ fabric. Ripstop gives the fabric extra strength. Creases are quickly released after unpacking and the fabric is quick to dry for your convenience. ⊙ ANTI-BACTERIAL TECHNOLOGY: SilverPlus anti-bacterial technology keeps your gilet smelling fresh for much longer without washing. ⊙ ADJUSTABLE WAIST: This gilet has an elasticated waistband that is adjustable by means of the drawcord and toggle, allowing you to adapt your gilet to suit the conditions. 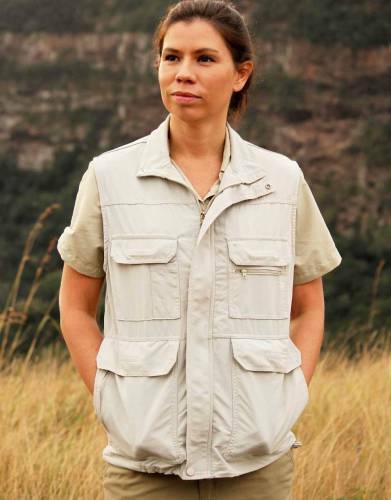 ⊙ ZIP: The Rufiji™ MaraTech™ Safari Gilet has a full-length zip which can be secured by means of the studs at the waist and collar, which gives it a seamless appearance. 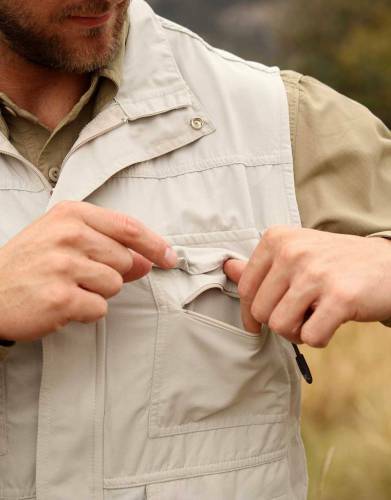 ⊙ POCKETS: Two chest pockets with velcro closure with one small zipped security pocket in one of the chest pockets and two slots for keeping a torch or pens on the other, one large zipped security pocket inside the gilet, two waist pockets with velcro access, one of which has a small security pocket, and one large pocket on the back of the gilet. STEP 1: You will need a measuring tape, a flat surface such as a table, a notepad to record your garment's measurements - and your own collared long sleeve shirt which is a comfortable fit. 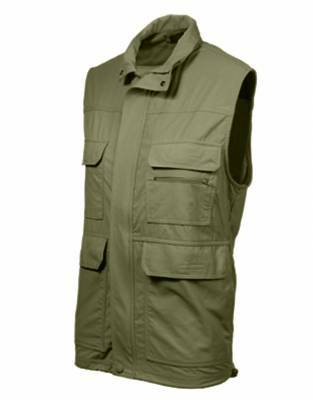 While this is not a shirt, it should give you an accurate idea of what size Multi-pocket Gilet to order. Tip: If you do not have a measuring tape, use your credit card. The long side of a credit card measures 8.5cm and the short side is 5.4cm. Simply use the centimetre measurements on our chart and divide by 8.5cm to get an idea of how many credit card lengths equals the measurement you are recording. STEP 2: Referring to the images above, place your shirt flat on the table and record the following measurements: ⊙ 1/2 Bust/Chest - Across the front of the shirt from armpit to armpit; ⊙ Centre Back Length - From the nape of the neck on the back of shirt to the bottom hem; ⊙ Sleeve Overarm - Sleeveless and so does not apply to this garment.